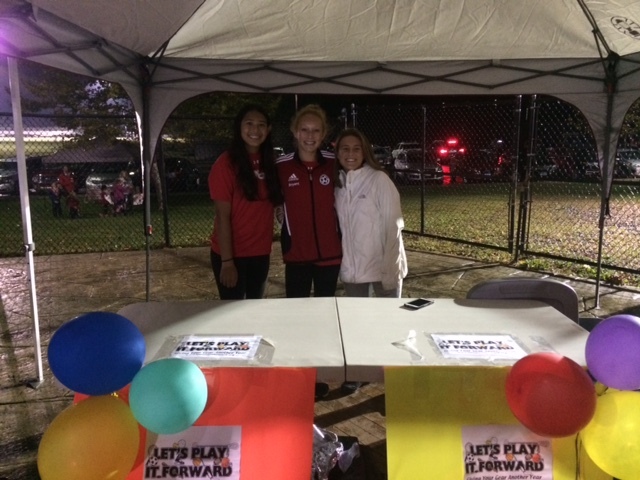 Let's Play it Forward is a not-for-profit 501(c)(3)organization started by a group of teens from Westchester, NY. 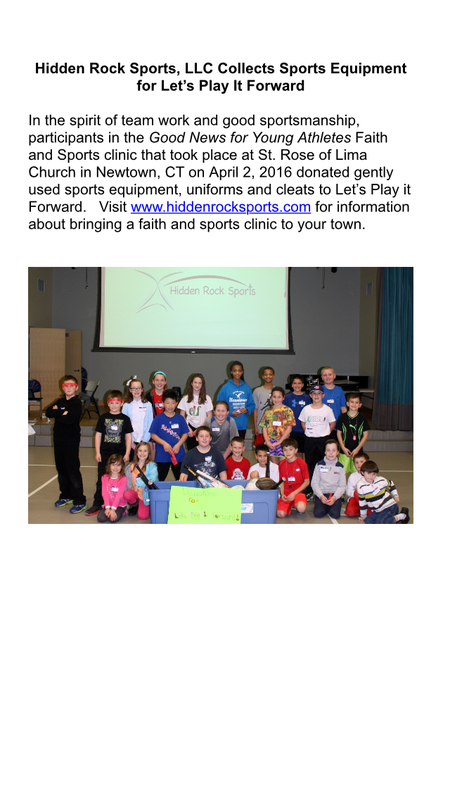 We collect and donate used sports equipment to children and organizations in need. 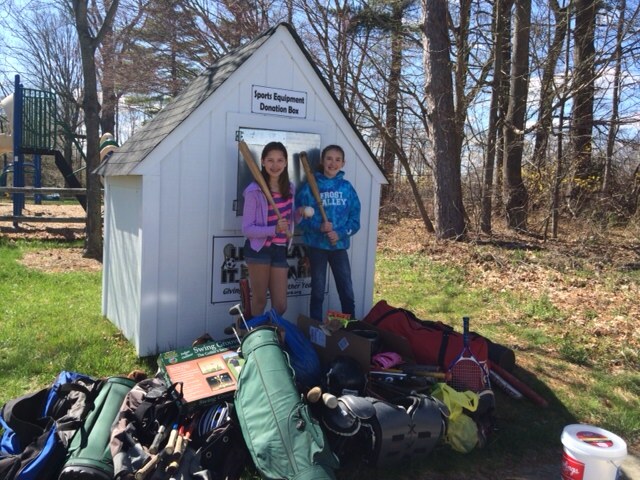 To date we have collected 78,949 pieces of gently used sports equipment. 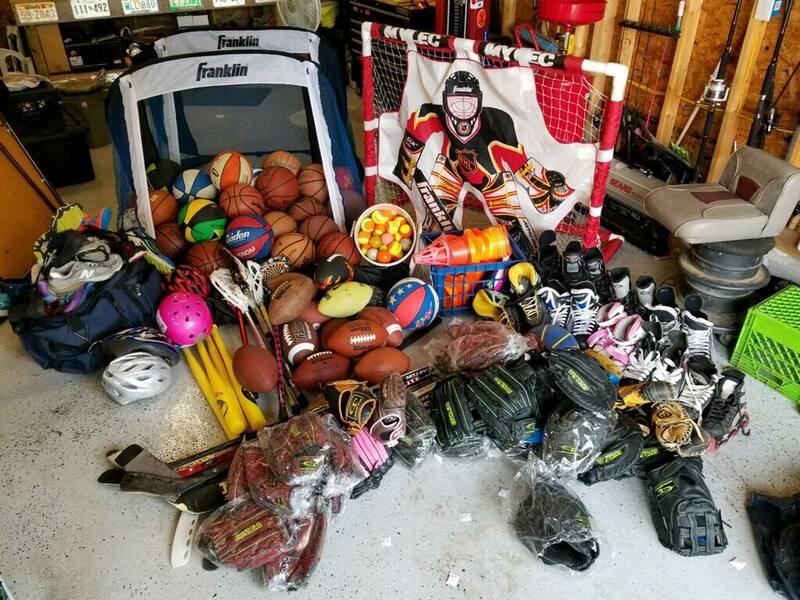 It all began when a few life long friends realized that they had an abundance of unused sports equipment in their garages. We started calling several organizations to inquire whether they could make use of this equipment, and the responses were overwhelming. 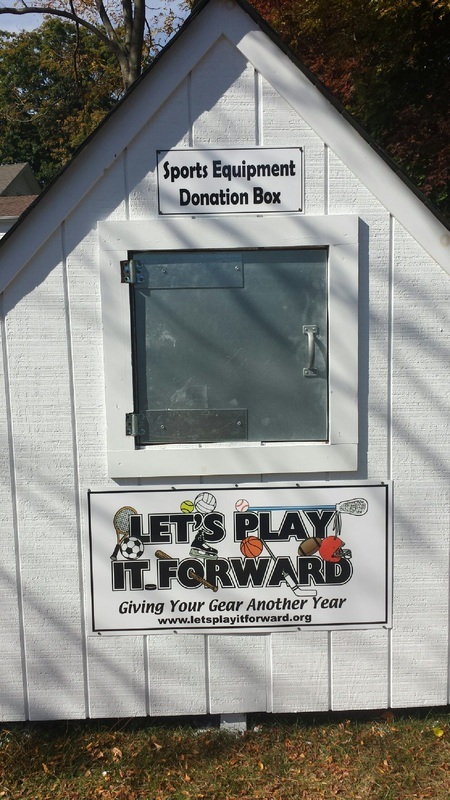 Let's Play it Forward was founded in February 2012, and our mission is to help charitable youth organizations and individuals in need to obtain the gear necessary to play the sports they love. We collect gently used sporting goods at organized events and through other donations. 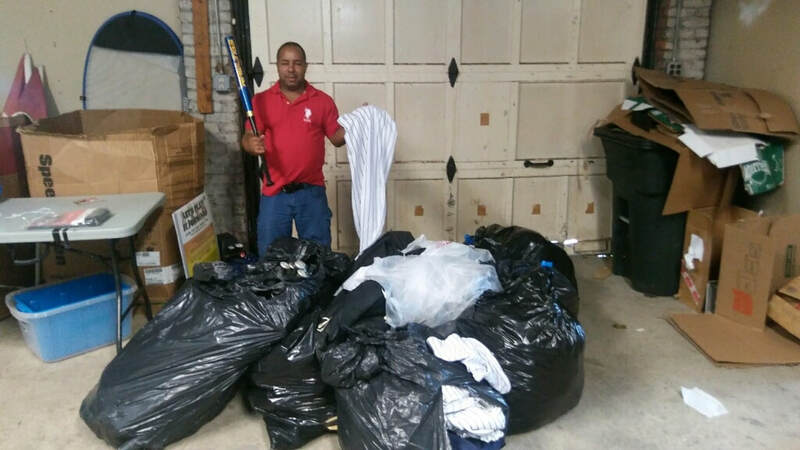 Westchester Recreation and Parks Society - WRAPS donations found new homes this week with Grand Slam Batting Cages & many children in need! 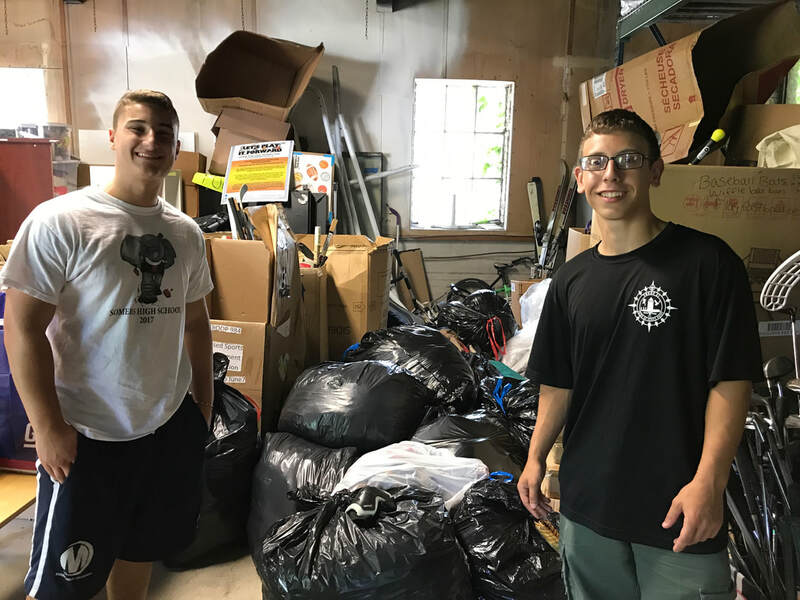 Andrew K, a sophomore at NJ's Montgomery High School, partnered with LPIF to start a club that runs collection drives and support our mission further. This is the first school organization created specifically to support LPIF's vision and we're thankful that Andrew felt enough passion to initiate this. We hope this could serve as a model for future clubs at other schools. Andrew and Matt M (another starting club member) drove up to our storage facility this month to transport equipment from their recent winter drive. They have more events planned for the rest of the school year and are excited to deliver more collected equipment to us in the coming months. 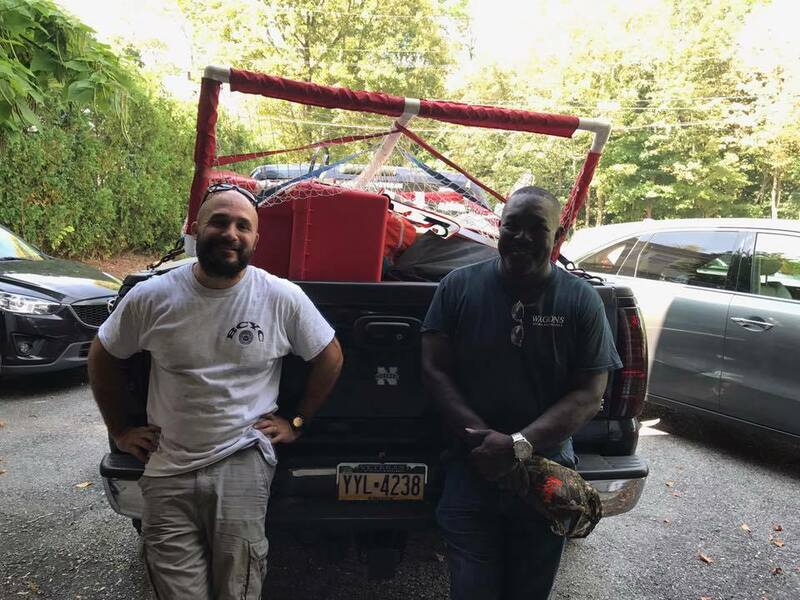 ​Coaches from various Bronx NY organizations at our storage barn (generously donated by Tom Kallish of Tommie Cares Foundation) come to pick up donated gear! Anthony Rao making his 2nd LPIF delivery. Anthony is working on his Eagle Scout Project and chose LPIF as the recipient of the gear! Thank you Anthony from Rockland County! 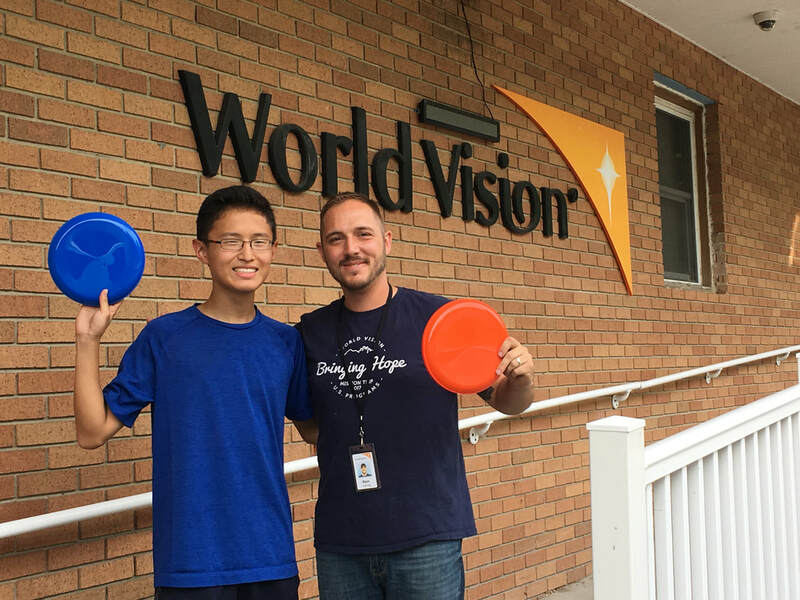 I'm happy to tell you that the frisbees were safely delivered to the World Vision Warehouse, and was able to be received by Ryan Wotring, the director of West Virginia, Appalachia for World Vision.Thank you, and I hope you have a great rest of the week! We received this message from a LI School this a.m. 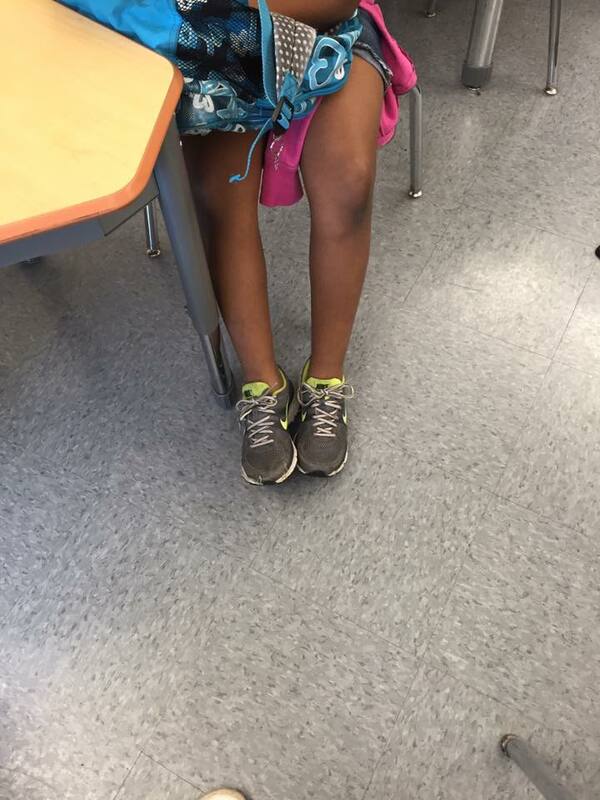 Thanks to Let's Play It Forward this little girl gets to participate in field day with the sneakers you donated. She showed up in flat shoes and wasnt going to be able to participate. You guys are the best! Peter Neuman from Hasbrouck Heights NJ is working on his Eagle Scout Project!! He pulled up in a UHAUL this weekend with 2080 pieces of equipment! THANK YOU PETER. YOU WILL MAKE MANY CHILDREN VERY VERY HAPPY! And thank you Antonio for always helping us!! Special Thank You to Abbe H from the Henrik Lundqvist Foundation for delivering all the gear she collected to help further our cause! We are grateful!! 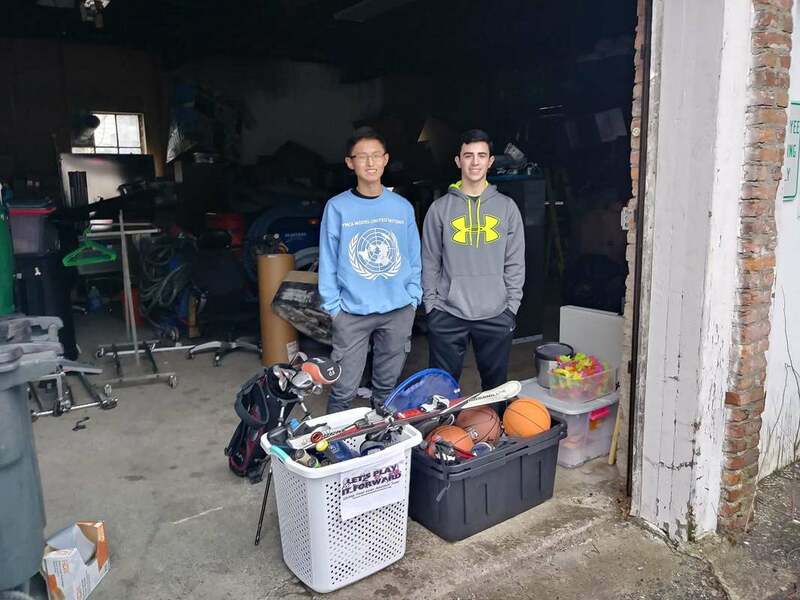 Happy to have helped Greenport High School with donations of basketballs, volleyballs, baseballs, and batting bags to help the students at their HIGH SCHOOL play SPORTS!! My name is Michael Ohonbamu. "I am a Masters International student at the University of Michigan School of Social Work. Currently, I am a Peace Corps Volunteer serving in Swaziland, a landlocked country within South Africa, under the Youth Development sector. I focus on establishing boys and girls club and introducing different sports at primary and high schools. Through these activities, Swazi nationals and I teach boys and girls life skills pertaining to HIV/AIDS, TB, STIs, sportsmanship, nutrition, exercising/stretching, peer pressure, self-esteem, and bullying. Just recently, local welders had fixed the basketball court in my shopping town. On that same day, they had a mini basketball tournament. I arrived with my basketball and notice that no one else had a ball to play with or proper gear. Despite that, the tournament went well. I believe that basketball has the potential to go far in Swaziland, which is why I am working on a sports ground project in my community to introduce basketball, among other sports, in 2017. I want to be able to teach Swazi boys and girls how to play the sport I love with all my heart." 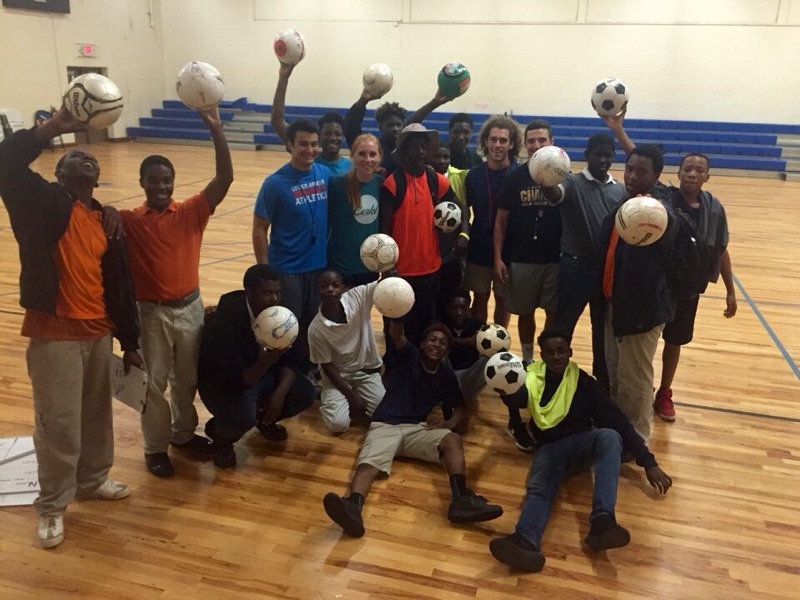 Thanks to Kurt K from HACSO Community Center for taking our soccer balls on his mission to Haiti! So many happy faces!! You rock!! We are happy to have shipped basketballs to Michael and fulfilled his request. Thank you to all our basketball donors. My name is Michael Ohonbamu. I am a Masters International student at the University of Michigan School of Social Work. Currently, I am a Peace Corps Volunteer serving in Swaziland, a landlocked country within South Africa, under the Youth Development sector. I focus on establishing boys and girls club and introducing different sports at primary and high schools. Through these activities, Swazi nationals and I teach boys and girls life skills pertaining to HIV/AIDS, TB, STIs, sportsmanship, nutrition, exercising/stretching, peer pressure, self-esteem, and bullying. Just recently, local welders had fixed the basketball court in my shopping town. On that same day, they had a mini basketball tournament. I arrived with my basketball and notice that no one else had a ball to play with or proper gear. Despite that, the tournament went well. I believe that basketball has the potential to go far in Swaziland, which is why I am working on a sports ground project in my community to introduce basketball, among other sports, in 2017. I want to be able to teach Swazi boys and girls how to play the sport I love with all my heart. If it is possible, please help us by donating basketballs (size 5-7) and/or any athletic gear you have available. We will deeply appreciate any support we can get. Thank you for taking time to read this email. Happy Holidays! The holidays are arriving early this year for children in the Bronx! Thank you to our donors and to Coach Velez! Thank you to all the volunteers and donors from Ardsley Cares. 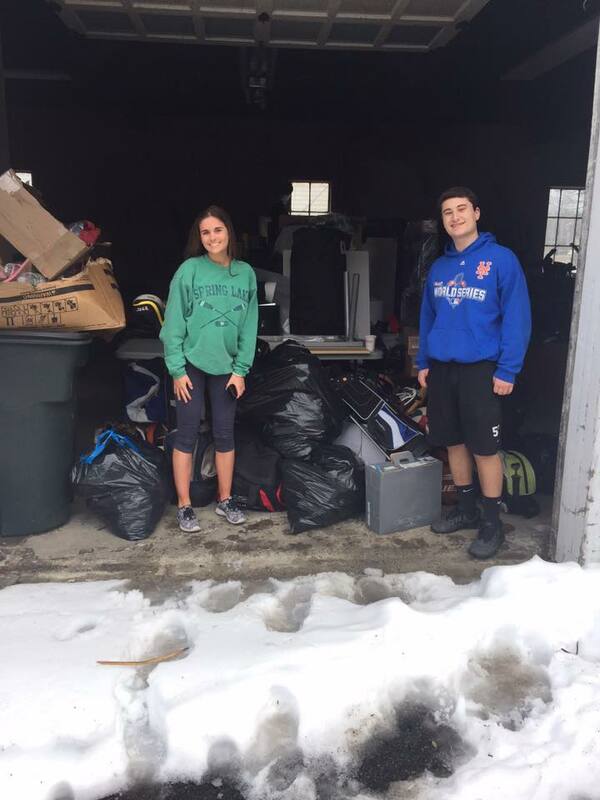 We are honored to find your donations a new home! Thank you for helping us with our mission for another year! "I would like to thank Pay It Forward Organization for donating a large donation of football gear to the Madison Square Boys & Girls Club Columbus Clubhouse girls flag football team. We received 33 football cleats, 60 different jerseys for basketball and football and pinnies, 6 shoulder pads, helmets, gloves, leg pads, and 10 compression shorts. Our girls flag football team deeply appreciate your donation. We were in need of the equipment for our flag football games and it definitely helped in a huge way. Thank you so much for passing the torch to make our younger generation much more productive and have a great experience playing flag football." Thank you so very much to Hank from South Orange NJ. 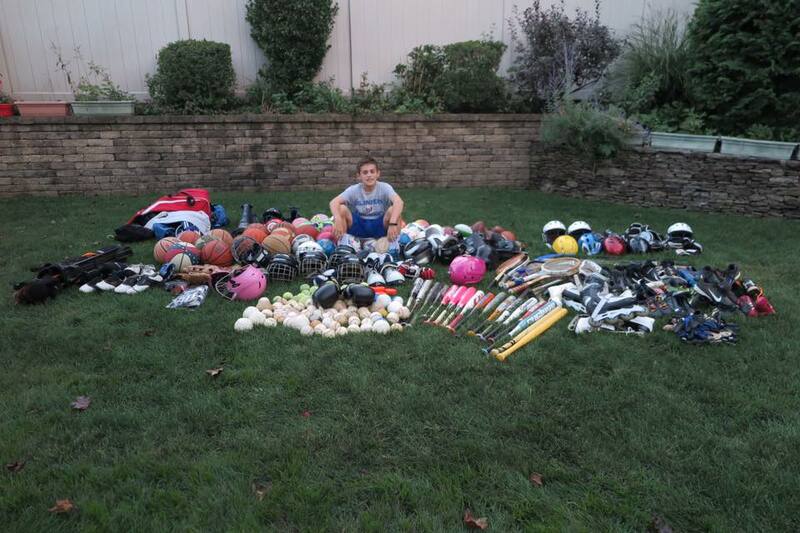 Hank collected 140 pieces of sports equipment on behalf of us for his Bar Mitzvah Project! Zachary Katz did an amazing job on his Bar Mitzvah Service Project on behalf of LPIF. We are honored to have received over 300+ pieces of sports equipment and also monetary donations!! Thank you Zach and everyone who helped support our cause. Thank you to Kim Goldhirsch and the Community of Red Hook NY for collecting on behalf of LPIF. Your donations have found a new home with the Hudson Valley Special Olympics in Wappinger Falls and Live 2 Serve in Louisiana. Brian Olifiers mission is to help kids in Baton Rouge get back their gear after the floods. With the help of our generous donors in our Somers Community, Wilson Sporting Goods in Chicago and UPS in Somers the first of many boxes left Somers yesterday headed to Live2serve in Baton Rouge. 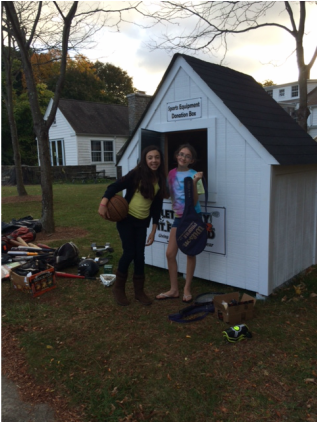 Our somers community rallied to drop off donations at our Van Tassel Drop House. 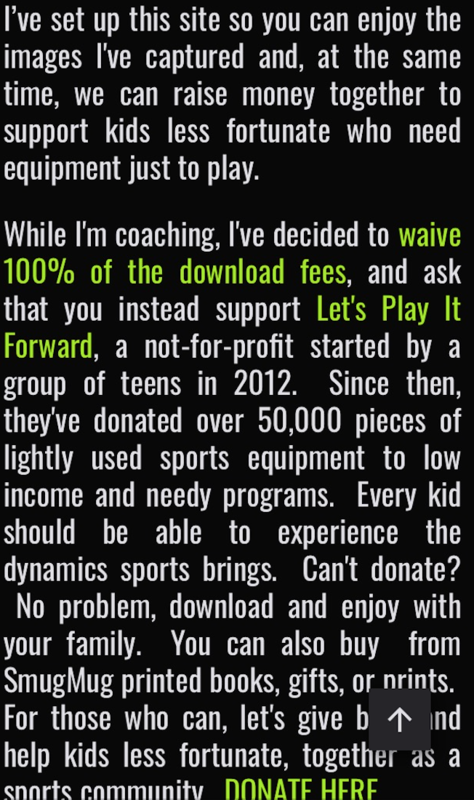 Anyone interested in helping this cause please contact Brian at Letsplayitforward@aol.com. We would also like to thank Tom Kallish for his support to pay for the additional shipping costs. Thomas Is 16 years old and a senior at Catholic HS in Staten Island, NY. He has played sports his entire life, focusing now on basketball and has volunteered at camps and basketball clinics every summer. He wanted to do something further to help underprivileged kids. 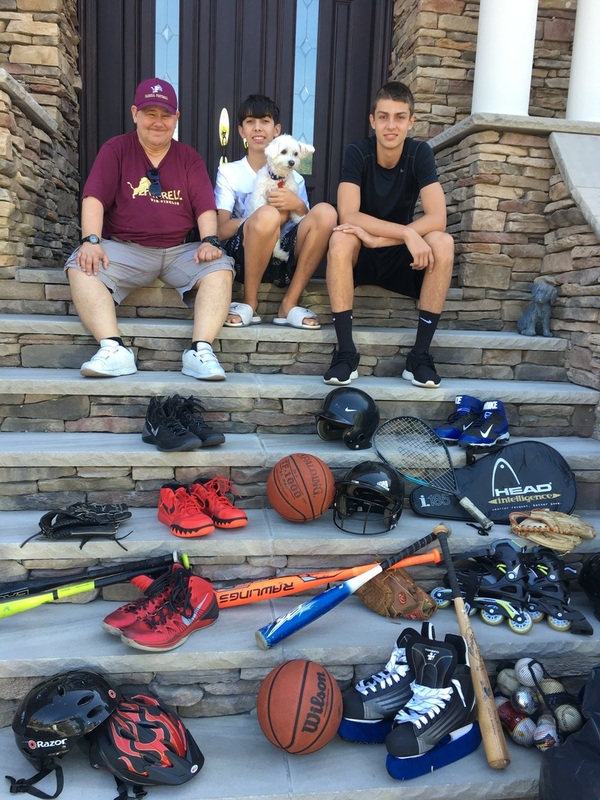 Thomas and his brother Peter (15) organized a used sports equipment collection in his community and donated our collection to Let's Play it Forward. These items will be sent out of the country to those in need to have the opportunity to enjoy sports. Thank you Thomas and Peter for all your hard work!!! We are thrilled to donate our tennis gear to Coney Island Generation Gap. We want to thank our tennis equipment donors and Antonio Velez for making this possible. ​Special thanks to Kimberly Nelson from Sayville NY. Kimberly is a part of a very big volleyball community. Her league gives each team a new ball every season. She started looking at the amount of extra volleyballs and she thought about all her friends and all the extra balls they had. People were very happy to donate, even friends that had moved away shipped her some. Kimberley's volleyball community has helped her in very hard times, so she hopes that these volleyballs bring joy to many others! HASCO Community Center in Spring Valley NY!! Tucker worked on a project called Operation: P.L.A.Y (Promoting Leadership in Active Youth) as a part of a program from the University of Alabama. He, along with a few other students in the Honors College, constructed and ran a short soccer season for the 8th grade boys of Francis Marion High School in Marion, Alabama. The boys learned not only the game of soccer, but worked on team roles and leadership skills, as well as pro-social behaviors and how to overcome adversity. 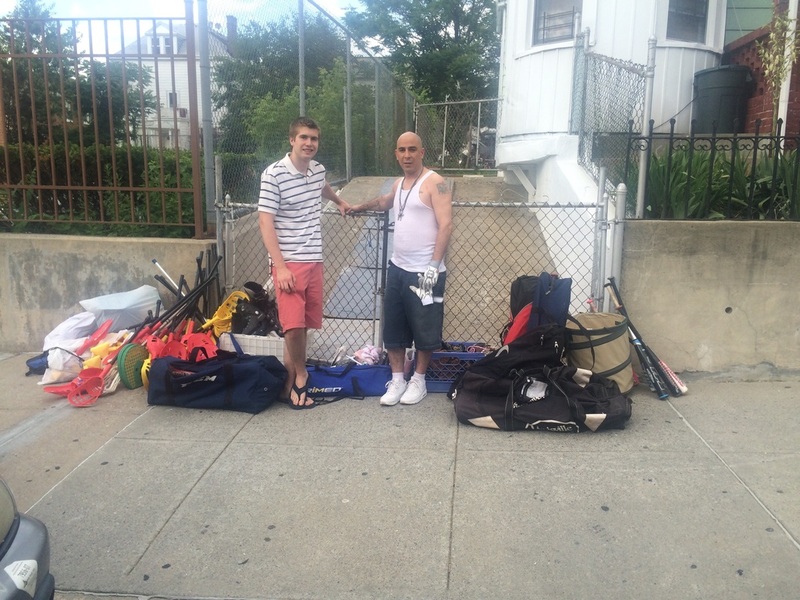 Coach Velez from Bronx NY has been a huge help distributing donated gear throughout the Bronx area to teens in need! We thank you Antonio for all you do! Thank you to Ryan for making the deliveries!! We would like to share an email with our supporters. We are able to fulfill this request once again thanks to all our donors!!! Hows everything going? My wife and I were able to support the first female soccer school here in Campo de Aterrizaje (small community near Cariari) and the boys league through your generous donation of soccer cleats and soccer balls. Attached are some of the students accepting some of the cleats. Our community is extremely grateful for your kind donation. Our girls soccer school has ballooned to over 50 girls from ages 7 to 17. Unfortuantely many still play barefoot due to the lack of cleats and how expensive they are here. The life span of many soccer balls here is also around 9 months considering how much rain we receive and the climate in general breaks down things very quickly and now have a need for more balls. I have family visiting in June and was wondering if it would be possible to receive more soccer cleats and soccer balls? We understand you cannot mail to Costa Rica, but since we have family arriving soon this would be a perfect time to have them bring them over with them. Thank you again for your time, generosity, and impact you made in this community already. So Thankful to Paige Herling high school junior from Lloyd Harbor, NY. was able to help the Deposit NY FIELD HOCKEY LEAGUE!!! Please help support our fundraising efforts to ship gear to the troops in Afghanistan! 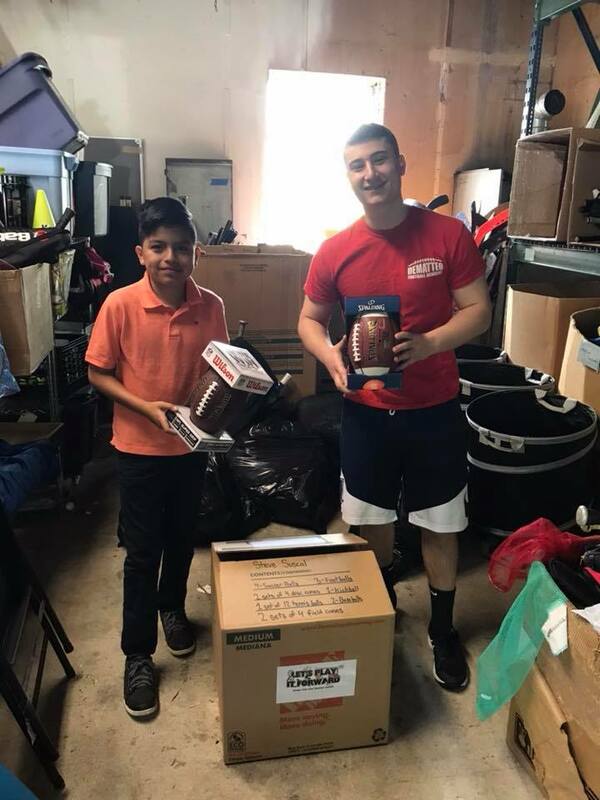 Special thanks to Sam Kessler (Syracuse Class of 2019) for organizing sports gear that was delivered in February to the students of Caráquez Ecuador through Global Student Embassy. Sam is working on more shipments as more missions take place throughout the year. 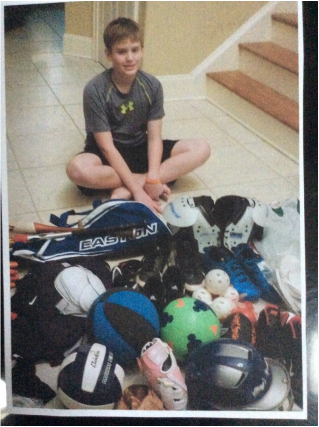 Andrew F celebrated his Bar Mitzvah this month (February) and worked hard collecting over 100 pieces of gear from friends in the Atlanta area. Thank you Andrew for helping us Play It Forward!! Thank you to all our soccer and basketball donors. Your donation has found a new home with these children in Haiti through OLTCH. Please visit oltch.org for more information. Special thanks to Jack Gonzalez's for working on a service project on behalf of LPIF. 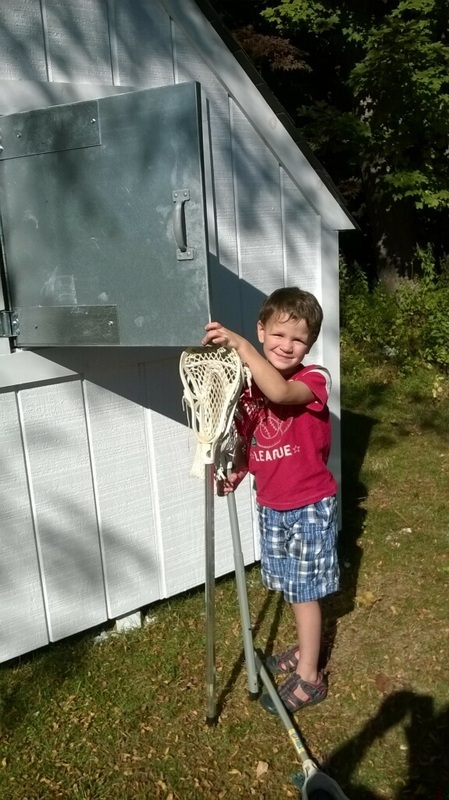 He gathered equipment from the Ridgefield, CT Little League and his community. He collected over 1000 pieces of equipment. 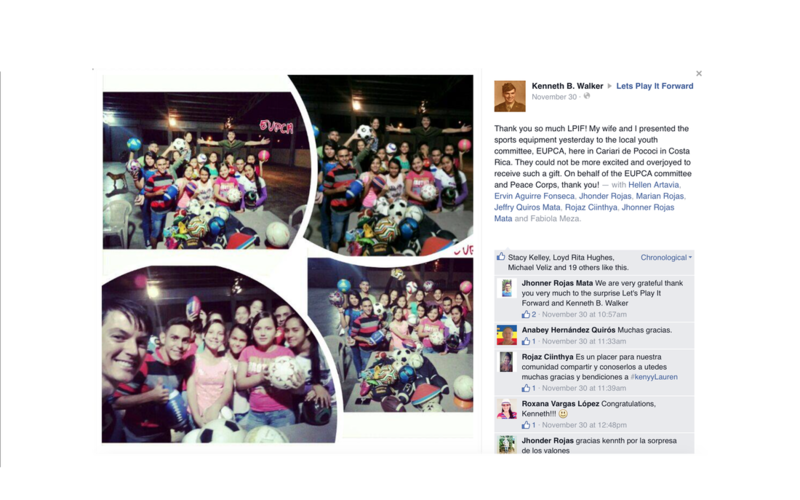 A few days later Ryan Wilson was able to deliver to an organization called Neighborhood Kids run by Antonio Valez. Antonio's programs run from April to August at Belmont Park in the Bronx. He invites kids from the neighborhood who can't afford to join a Little League or to purchase equipment. Thanks to all our baseball donors. Your gear has found a new home in Cuba. Special thanks to Ethan K from NE Pennsylvania. 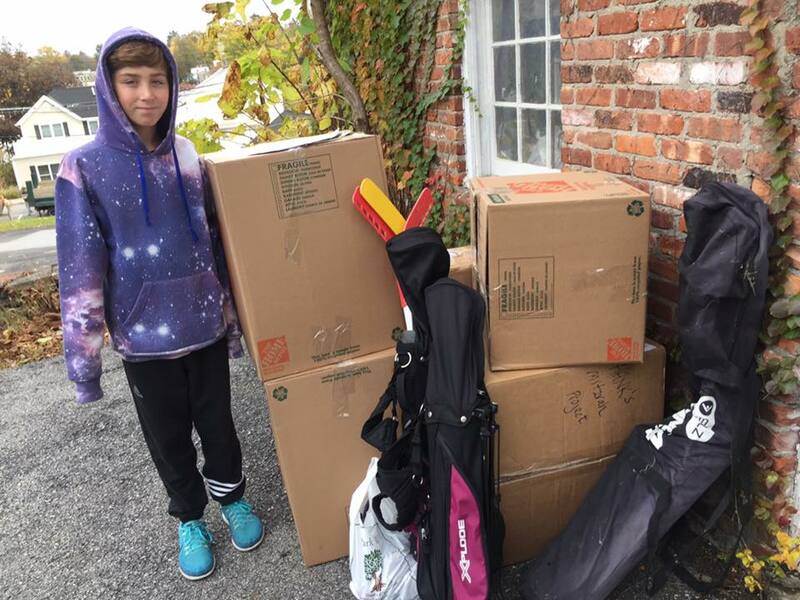 He collected sports gear for his Bar mitzvah service project! It is headed to The Wilson Park Community Center in Syracuse NY today thanks to Sam Kessler!!! 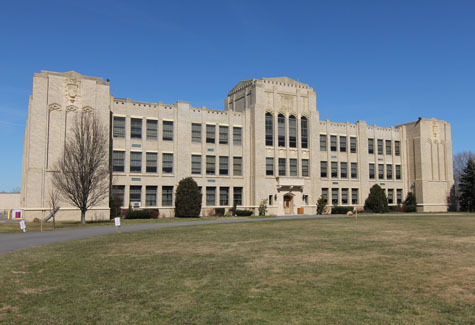 School in CT. Whitney collected uniforms and gently used cleats/shinguards, etc. from the local soccer travel program to donate to LPIF. We appreciate all her hard work and dedication to our cause. Thank you to the Darien CT community for your generosity. Thanks to Carlo D for working at our storage barn for his Wise Project. He will soon be reaching out to children's organizations in need of gear and invite them to select items at our barn. If you know of any organization in need please email letsplayitforward@aol.com so they can be on his invitation list! We are excited to announce that JT Olert's Eagle Scout Project is up and running at Van Tassell Park in Somers NY. Donors can now drop gear in the collection house 24 hours a day. If you would like a tax donation receipt mailed to you please email us after you have made your drop off please. We thank "For the Love of baseball" and Timmy H for being our very first donors! 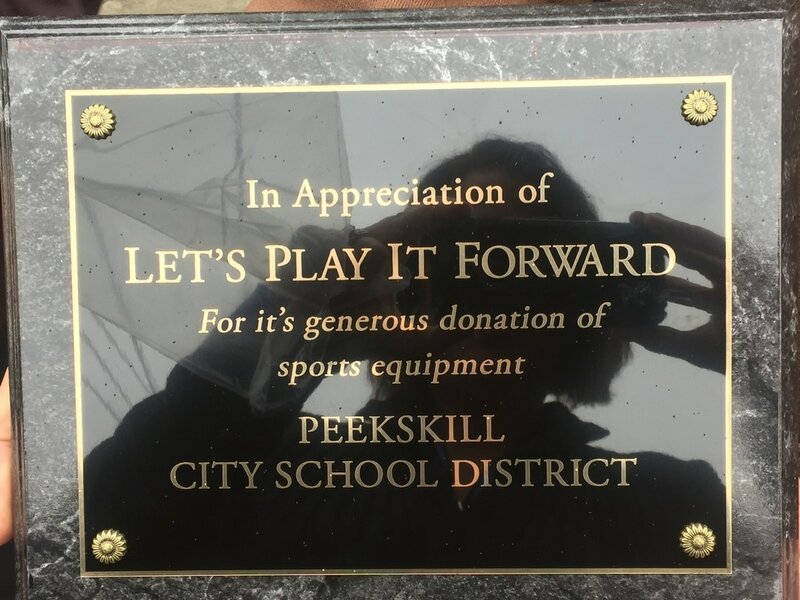 Also would like to thank Probuild, Vinyl King and Signs inc.
Special thank you to FOR THE LOVE OF BASEBALL, for making a donation of gear in our collection bin located at Van Tassel Park, Somers, NY. 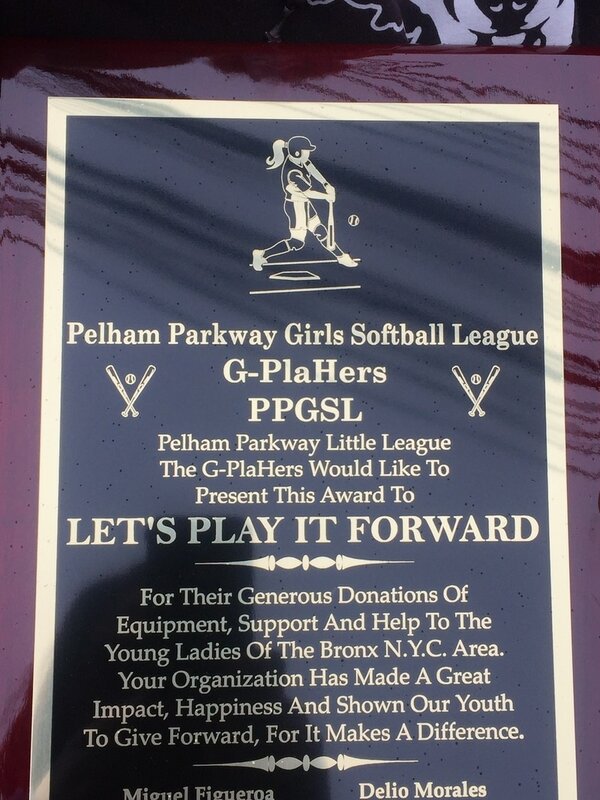 The baseball gear has already found a new home with the Pelham Bay Little League in the Bronx! Thank you also to all of the Hendrick Hudson donors and the the HenHud superintendent Joseph Hochreiter for his support of the collections!! Children in Limbe receive your donations through African Volunteer Football Academy for the less Privileged (AVFAL),!!! Successful Make A Difference Day Weekend 10/26 & 10/27. We collected 1078 pieces of gear for our military troops. Thank you volunteers and donors. Soccer Balls Have Reached Ghana! Thank you Volunteer Center of The United Way for allowing us to participate in 9/11 Serve and Remember at The Kensico Dam. 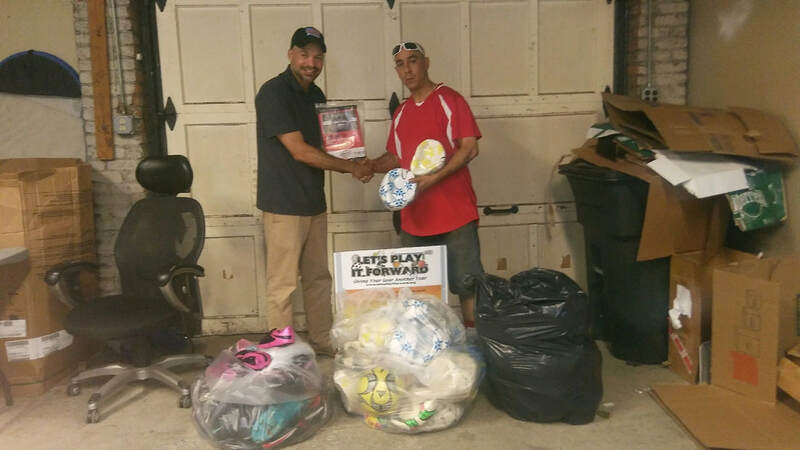 OPERATION LPIF: During the months of September & October we collected 1031 pieces and counting of new and gently used soccer balls, baseballs, footballs & frisbees for our military troops. The LPIF Founders along with Rob Astorino, Westchester County Executive, Marsha Gordon, CEO Business Council of Westchester and Tom Kallish founder of Tommie Copper Inc. at the Westchester Business Council dinner at the Rye Town Hilton in October 2012.